Last Updated: October 13, 2015 | Subscribe to our weekly newsletter! Your winter pool cover is meant to protect your swimming pool, but are you doing anything to protect your pool cover? Recently, someone emailed me asking me if they should even cover their pool because they were afraid of the cover being damaged by the windy winter weather. Triple W score! Is it okay to leave an above ground pool uncovered during the winter? We live in a windy area and covers end up like parachutes. I’m afraid of damaging the pool. I’ve tried clips and the wraps. Nothing seems to help to keep the cover down. You should always cover your pool in the winter if you’re not going to swim in it. The cover protects the pool from the elements. Without the cover, you’d be constantly skimming and vacuuming the pool all winter, and you don’t want to be doing that when it’s freezing out. There are a few simple things you can do to protect your above ground pool cover from winter weather damage. If you’re buying an above ground pool winter cover for the first time, make sure you buy a good heavy-duty cover with grommets. 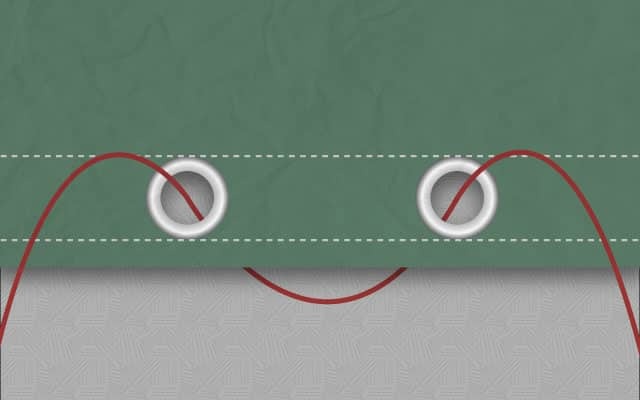 Grommets are holes around the edge of the cover with metal rings. If you just use a plastic tarp, they may not have these, and I wouldn’t recommend using just a plain old trash bag tarp. If you buy a winter cover designed for above ground pools, it will come with a cable and a winch to ratchet down the cover. Wrapped the winter cover under the rails and loop the cable through the grommets. Make sure it’s nice and tight when you ratchet it down. Here is how you properly loop the cable through the grommets on an above ground winter cover. I know you said you’ve tried, but that doesn’t mean I would stop using them. Cover clips are a simple device that clips the cover directly under the above ground pool rail. They’re cheap and add that extra layer of cover security. The more the better. However, if you’re not fond of the cover clips, you can use a winter cover wrap. Adding some extra water to the top of the cover will help protect from wind damage. You should keep an eye on the water level because you don’t want it to get to high. If it does, use a cover pump to remove any excess water. Speaking of above ground pool covers, you should get an air pillow. Despite what you might think it is, it’s actually an ice compensator. When your pool water freezes during the winter, and the ice expands, the pillow under the cover will absorb the expansion and protect the walls of your pool from damage. There are some enemies that threaten your inground winter cover, including: Ice, Rain, Snow, Trees and animals. To protect your winter cover against ice, let the ice melt so you can remove it with a winter cover pump. Don’t try to remove the frozen ice because it can have sharp edges. Pool covers don’t like sharp objects. You can also prevent large ice build-ups by keeping a 1/2″ water level on top of the pool cover (unless you have a mesh cover, because then it would just fall through). To Protect Your Cover Against Wind, keep that 1/2” of water on top as it also helps with the ice. Two birds with one stone! If you have a tarp cover instead of a safety cover, use water bags or aqua-blocks to hold your cover down (Never use coffee cans, bricks, boards, etc. if they fall in the pool that can damage your liner). And that’s no bueno. To protect your cover against trees, hire a professional tree specialist to remove any overhanging tree limbs that may land in your pool. Dead tree limbs are a #1 cause to holes in swimming pool covers during the winter (according to a study I read somewhere on the information super highway). You can also buy a swimming pool leaf net that installs right on top of the pool cover. To protect your cover against rain and melted snow, pump the water off the cover with a winter cover pump or a plain ol’ homemade siphon. Finally, to protect your pool against animals, install a sturdy pool fence, 5 or 6 feet tall is usually enough to keep out most four legged animals. Also, keep the cover clean so animals won’t be attracted to your pool in the first place. If your cover has suffered some damage points and is in need of a repair, a temporary fix can be made with duct tape. Is there anything you can’t fix with duct tape? Patch holes promptly, to prevent them from spreading. For safety covers, or if you want a better patch on your solid pool cover – you can use mesh cover patches available at your local pool supply store, cover manufacturer or online. If you have questions about closing or winterizing your inground or aboveground swimming pool, ask them in the comments below.